The first new style is called the Tin Cloth Original Briefcase (#70016). The bag retails for $295 and shares the same basic layout and size as the classic 256, with a few important differences. First, in addition to classic tan, it is now available in black; so if you have ever dreamed of the day you could buy a black Filson briefcase, the wait is finally over. 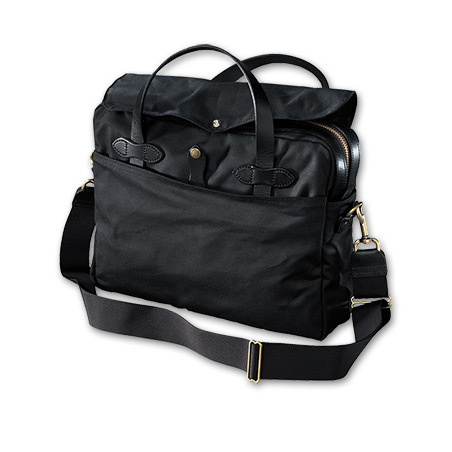 Second, the bag is constructed entirely of Filson’s legendary 12.5 oz oil finish tin cloth. This will make the bag even more weather resistant than the cotton twill and will give it a darker more broken in appearance, even when fresh out of the box. I would also expect these bags to take on a deep patina very quickly. One other thing to note is that the trademark bridle leather shoulder strap has been replaced by one constructed of nylon webbing. Perhaps it was an aesthetic choice made to visually differentiate these bags from the 256. On the other hand, it may have been a functional choice that distributes weight more effectively than the often stiff and slick bridle leather shoulder pad; however, it is definitely something I need to see in person before I pass judgement. Variety is a good thing, and these new variants simply solidify Filson’s Original Briefcase as a true classic that isn’t afraid to evolve and have a little fun in the process. I will definitely be adding the black Tin Cloth briefcase to my Christmas list and counting down the days. Post a comment to let me know what you guys (and gals) think about these cool new styles. Out of curiousity, would Filson sell someone an bridle leather strap if they asked? I’m thinking that when I get a 256 I would prefer the tin cloth because it rains quite a bit here in the Pacific northwest and I spend good amount of time outdoors. Yes…if you call customer service, they will sell you just the Bridle Leather strap for your bag. I have heard prices in the $45-$70 range. Just FYI, I have put the standard wax treated twill bags through some very inclement weather and never had a problem with water. So, I would only choose the Tin Cloth if you happen to like the look better, but rest assured that most Filson bags can handle anything you throw at them. Also keep in mind, there are a couple drawbacks to the Tin Cloth…it has a moist feeling to it and it can stain furniture or even other clothes that it comes in contact with if you are not careful. It is also a slightly thinner fabric to start with, so it will produce a less rigid bag. Any additional water resistance to be gained should be carefully weighed against these potential drawbacks. I didn’t realize that the tin cloth was visually different from the regular other. Thanks for pointing that out and for letting me know about the drawbacks to the tin cloth. I find it curious that they charge as much more as they do for these bags. I’m a little surprised that the tin cloth is considered that much better than the standard twill. So much so that they charge an extra $70 for the bag, then replace the $45-$70 strap with a cheapie. I’m curious as to the rationale behind this. Oh well. Thanks for your comments, Jay. I agree with you, I much prefer the standard twill, which is also treated and does very well when exposed to water. My problem with the Tin Cloth version is that it will stain car seats, couches and clothing with its oily finish. I am also not sure why the strap was replaced. I think it was just a strategic move to add a “new” style of a classic bag to their product line without doing a lot of extra work. With the exception of a very small group of buyers (wilderness workers or those in very wet conditions like the Coast Guard) I think that the standard twill is a much better option. Thank you, Charles for the nice breakdown of the differences between the two. I’m one of those guys who have been waiting for a darker color briefcase to use in an office environment. How is the durability of tin cloth vs the traditional canvas used for the classic briefcase? Would a tin cloth briefcase still be a “bag for life”? How about the fading? I’ve read that the green canvas version has a lot of color fading fast. What would the patina of a black tin cloth bag be like? Would it look washed out fast? Thank you for visiting FilsonFan.com! I have not noticed a great deal of fading with any of my Otter Green pieces. As far as the difference between the Tin Cloth and the classic twill, unless you have a compelling reason (water resistance or harsh environments) I would stick with the classic twill. The oiled/waxed Tin Cloth has too many drawbacks for me to use on a daily basis in an office environment. The tin cloth is thinner, which results in a bag with less inherent shape. In addition, the finish can stain car seats, clothing, couches, etc. It is not a tradeoff I am willing to make, especially for office use. If you are a surveyor and plan to actually be out in the field, then perhaps it would be a great alternative, but I don’t think you can go wrong with the classic twill. i was wondering How much is Tin Cloth Original Briefcase (#70016) weight? Hi David. 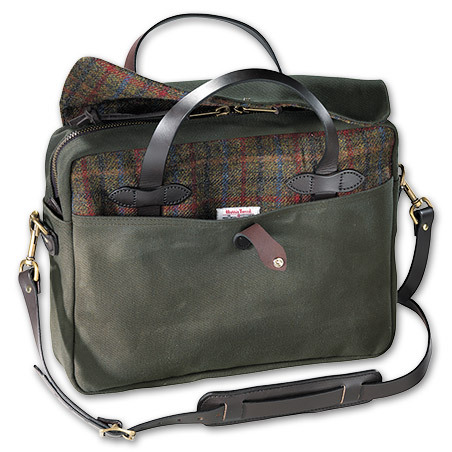 Although I am not sure of the overall weight of the briefcase, it is constructed of 12.5 ounce tin cloth vs 22 ounce twill for the original 256. I have heard that the tin cloth version feels much thinner and does not hold its shape as well as the original. Hi Don…thanks for visiting FilsonFan! I have a few articles of clothing in Tin Cloth and when they change color or fade, I have not found a way to restore a uniform color; however, that is the nature of tin cloth. I personally think that the patina that a bag develops over time is very, very cool and makes the bag unique to you. It becomes a trusted friend that tells a story with each mark. Your best course of action…embrace the patina and keep using that bag the way it was intended! My experience with Tin Cloth in highly abrasive conditions is that it doesn’t resist wear as well as twill. I’ve had two (2) Tin Cloth coats develop holes MUCH faster than other Filson products and would assume my Twill Bag (3 yrs old) that seems bomb-proof will outdistance the lighter, thinner product of Tin Cloth. Thanks for your comment, Seth! I agree with you 100% about the wear-characteristics of Tin Cloth vs Rugged Twill. All of the bags in my collection right now are rugged twill (partially for that reason). I have the tin cloth original briefcase and I have to say its Perfect! 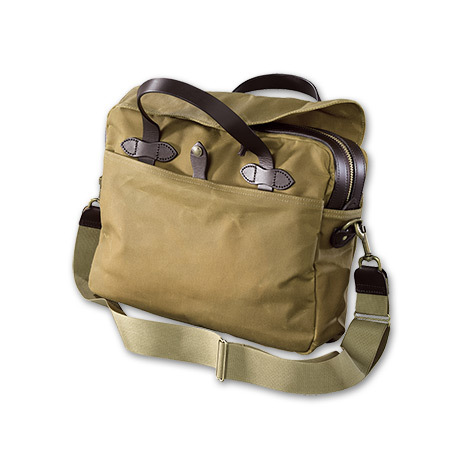 I use it for everyday work and private to carry my essentials and its really Great to wear! Its really light and the strap is much more confortable than the bridle leather One! I really like it a Lot! The patina is just out of the box and I can’t wait to See how it ages!! !